Figs. Not everyone loves a fresh fig but none can deny their lush, velvety beauty, the deep purple, greens and browns on the outside, and the visual burst of ripe redness inside. I love figs on a cheese plate drizzled with honey. I love fig jam even more. Making jam gives me so much pleasure – the chopping of the fruit, measuring of the ingredients, watching the slow bubbling of the mixture coming together as a thick syrupy jam. Time literally slows down. I adore making jams of all kinds and these days tend to experiment with the flavor and fruit combinations. I’ve mentioned before my grandmother in Virginia first taught me and inspired me to make jam. She and my grandfather planted fruit trees on their property nestled next to the water of the Chesapeake Bay. Every summer we made jam from the cherry trees, peach trees, apple trees, grape vines and more. She also loved canning. After the summer’s bounty and canning sessions she would fill a large wooden cabinet in the basement with her jars of jam, pickled beans, okra, watermelon rind, bread and butter pickles and more. When those old wooden doors creaked open the rows of colorful jars gave me so much delight. I would sneak down to the cool basement just to open the doors and stare at the beautiful bounty. 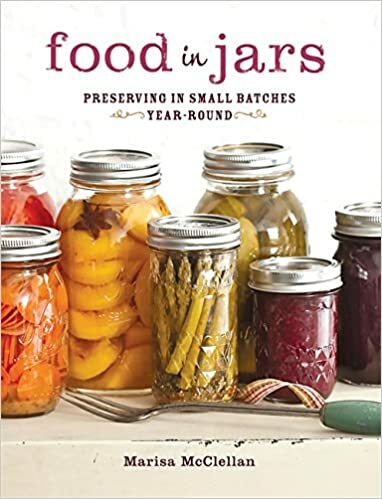 Years later, when I came across Marisa McClellan’s book Food in Jars, it was love at first site. If you are new to jam and canning, check our her site for tips and tricks on canning 101 to get started. Recently I made a fig jam and added fresh thyme and lemon juice. The taste gives it deeper, brighter layers than a typical fig jam. Try it out and let me know what you think. 1. Remove the stems from the figs and coarsely chop. 2. Wash your lemons, and using a vegetable peeler or pairing knife, cut thin strips of the lemon rind, being careful not to include the white pith from the lemon rind. 4. Put the figs, sugar, lemon peel, lemon juice and sprigs of thyme in a heavy-bottomed saucepan. Stir to combine. 5. Bring contents to a boil over medium-high heat, stirring frequently. Reduce heat to low and let simmer 45-50 minutes, depending on desired thickness. Make sure the mixture does not stick the bottom of the pan. While the jam is stewing prepare the jars in a boiling water bath. 6. Remove and discard thyme stems and lemon rind (although a few pieces left in give a bright burst of lemon flavor, which is lovely). 8. Remove the pot from heat and ladle into 4 regular-mouth pint-sized prepared, sterilized canning jars. Wipe the rims, apply the lids and rings, and process in a boiling water bath for 10 minutes. I love the cool, crisp Fall in New England. The cooler days, the changing leaves, the dark evenings, all make me want to curl up around a fire and have meaningful conversations with my friends and loved ones. This season always makes me pause and think about the year ahead – as it feels like a beginning with the kids back to school, and I start planning out the festive holidays to come. The fall has so much bounty that inspires me: gorgeous dahlias, zinnias, cosmos, leaves turning their golden hues, apples heavy on the limb – ready for picking, pumpkins and gourds of all shapes and sizes. All of this quietly stirs up anticipation within in me… thinking about what is to come, what I can create and make, bringing friends together. As the season quietly transitions from Summer to Fall with the days getting shorter and cooler, this site is also quietly transitioning. August Ardor remains all about passion. I still welcome guest posts, written by my insanely talented friends, whenever they feel moved to share anything about their passions; however, I want to bring some focus to my efforts, which can be wrapped up around a table. I have always loved gathering people together, planning delicious meals, flipping through cookbooks (another deep passion of mine) and setting a fun and inspiring table. I know my love for this grew out of spending summers with my Grandmother Corinne Earle every summer in the country, down on the Chesapeake Bay in Lancaster County, Virginia. She was the ultimate southern hostess and taught me to garden, make jam, set a table, make biscuits, steam crabs, plan a party and more. Beautiful design, in every form from architecture, to interiors, to painting, to setting a table all inspire me. I want to focus on these topics – entertaining tips and tricks, recipes, inspirational thoughts, mindfulness, healthy living, and beautiful design. Krister will share his passions and architecture. Today as the blog takes it’s new focus, Krister and I are launching my long-time dream of August Table, an online store with handmade block print linens that we have designed and had made in India, along with curated products that we love – to help inspire you to be the baker, the cook, the entertainer, the designer and the gardener. All things that I am deeply passionate about. Helping inspire others around the table is a passion project. If you gather in the kitchen, around the table, on a picnic blanket, you are hopefully with people you love and care about and have healthy delicious food, which can be very simple and fresh – not a huge ordeal. The main goal is to make connections. Slow down. Savor each moment and every bite. Relax and Enjoy. A common thread I always talk about is slowing down and unplugging. Perhaps it’s because I too get easily caught up in email, busy life, my wonderful job in corporate innovation, trying to pack in too much all the time. I long for quiet days filled with beauty and slowness, which can take many forms. Making time for creation, things that inspire me, including writing this blog, help me find my quiet days of beauty. If you inherently long for something, become it first. If you want gardens, become the gardener. If you want love, embody love. If you want mental stimulation, change the conversation. If you want peace, exude calmness. If you want to fill your world with artists, begin to paint. If you want to be valued, respect your own time. If you want to live ecstatically, find the ecstasy within yourself. This is how to draw it in, day by day, inch by inch.